My husband is a huge fan of my brownie pops! Tomorrow is his birthday, so I thought I would make him a GIANT brownie pop instead of a cake:) I know it will bring a corresponding giant smile to his face. It definitely has a certain WOW factor to it. It was made just like a regular size brownie pop, except that I used the whole batch of brownies to form it instead of dividing the batter up into individual pops. It's even covered in chocolate candy melts. It will be divided up when it's eaten though:) This giant pop would probably make 20-24 small pops. We'll see how it works out tomorrow. I suppose I will slice it up. I will need to use some candy melts to adhere some birthday candles to the brownie pop to make it a proper birthday "cake". All packaged up and ready to present to the Birthday Boy! *Bake a batch of brownies~homemade or boxed (I used our favorite: Ghiradelli Triple Chocolate), enough for a 9x13 pan. *Put the whole batch (I omitted the crunchy crust and saved them in the freezer) in a large mixing bowl. * Add just enough icing to form a giant brownie ball. I only needed about a 1/2 cup. *Refrigerate it for about a half hour just to firm up, if needed. *Melt the candy melts according to the package directions and spread with a spatula. *When the candy melts harden, lift up the pop and spread some candy melt on the bottom of the pop to cover. Voila! A MEGA BROWNIE POP! Enjoy, and have fun! Oh my god, that's awesome. So cool! Happy Birthday to him! Way to turn the tables on the miniaturizing craze :) It is a totally perfect cake for a brownie pop lover. Best.wife.ever! I can only imagine how blown away he will be when he see's this gorgeousm gigantic, brownie pop! I agree with one of the comments above, time to go BIG, mini's need a break :) A very happy birthday to your husband! whoa thats huge!!! my kids also are getting brownies for their school bday celebration tomorrow! (think they are sick of cupcakes!) great job as always!!! This is just so fun! You are so good to him. 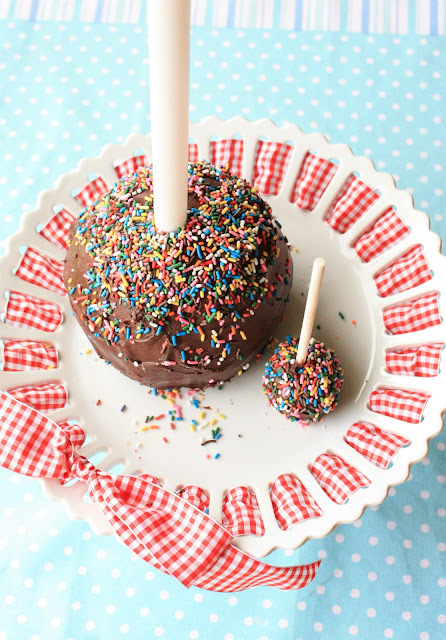 that is so much fun, giant cake pop. he is going to love it! What an adorable cake to bake for someone who loves brownie pops! He will love it. Sue this is so cool! Happy birthday to your husband. I bet this was a giant hit! Totally awesome! How cute ...love the idea :) :) A very happy b'day to ur husband too !!! My kind of brownie, it looks so good. That is a great idea for one person. I love it. Think I might have to try making one sometime soon. Thanks for showing us. What a fun idea! I love it in MEGA size. It would be fun for a dessert for a couples party where they each share one. Nothing could be better - I love brownies and a mega brownie cake pop would be the best birthday gift ever! ooh I bet hubby LOVED it! Very fun! Thanks for sharing Sue! I am just beside myself! How cool! That is hilarious! My husband is also a huge fan, we use cake instead of brownies, he likes yellow cake, but still that is a GREAT idea!! Brilliant! Now that we've made everything small and miniature it's time to flip the switch! Happy Birthday to your husband. That is INSANE!!! but completely makes sense to me :) That's a great birthday cake and I'm sure the boy in him loved it! What I would give to have that big brownie pop in my life. Delish. That's amazing! I wish I thought of that! It's like a giant caramel apple, but only better! This looks yummy! What was his reaction?